Robert Del Grande’s RDG + Bar Annie is the spiritual successor to Café Annie. : Walking through the glass doors into RDG + Bar Annie, you find a funky-plush bar bedecked with neon-hued, overstuffed sofas. It’s definitely not the old Café Annie, which closed after nearly three decades of serving Southwestern cuisine. Instead, it's Annie's sleeker, more contemporary cousin. But make no mistake: executive chef Robert Del Grande’s dishes are still delightful. 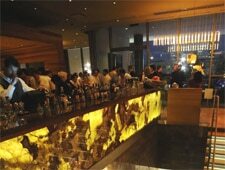 The restaurant is composed of three rooms: the downstairs BLVD Lounge, the upstairs Bar Annie and the RDG Grill Room. Each has its own menu, although, going along with the relaxed atmosphere, you can order anything, anywhere. Annie fans will find many favorites still available, from the filet mignon crusted with ground coffee to the roasted red fish Veracruzana. And the black bean terrine has been deconstructed into a dip of black beans, chorizo, chiles and goat cheese. As for new dishes, we recommend the baked potato fritters with bacon, cheddar and chive dip, and the maple-cured Texas quail with wild mushroom chile. The extensive wine list includes dozens of by-the-glass options. We like the communal dessert menu, too, with its glazed mini-cinni buns.